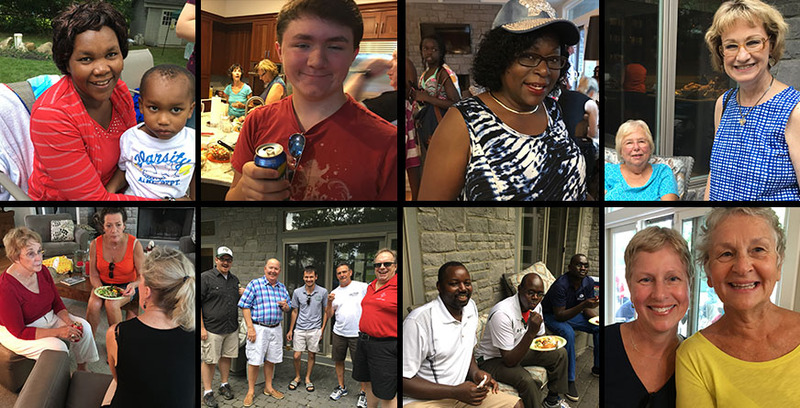 This past Saturday, members of St. Augustine’s along with their families and friends gathered at the Patrick’s house for our annual picnic. With the inimitable Curt Collins manning the grill, meats were grilled to perfection, and the rest of the congregation rounded out the meal by bringing what can only be described as a plethora of salads. Much fun was had by the young and old (but, let’s face it, mainly the young) in the Patrick’s lovely pool, culminating in an extended water balloon fight that miraculously spared the adult non-combatants. Perhaps even more thrilling than the water balloon fight was the harrowing journey that several guests faced on Alan’s boat. While it wasn’t quite a three hour tour, the boat stopped working out in the middle of the river and had to be towed back to the house by the police. Never a dull moment at a St. Augustine’s picnic. Despite one torrential downpour, the weather cooperated and all were able to enjoy good fellowship, good food, and good fun outside. We hope to see you all there. Click here to see photos of the event.